So yesterday was Cinco De Mayo...and of course after one of THOSE days at work, and it being the holiday, I decided that I simply had to have a margarita when I got home. Although I had all the ingredients for a classic margarita, I decided to think outside the box, and make a non-traditional one. I had a few over ripe cherimoyas sitting on my counter...so the puree of the delicious fruits found its way into my post work stress relieving drink. I also decided to veer away from the traditional lime juice and orange liqueur and use lemon juice and honey as well as some vanilla extract. Now that I look back on it the only thing traditional about this drink was the tequila! But what the heck...the end result was delicious, stress relieving and I can still call it a margarita because it contains tequila right? 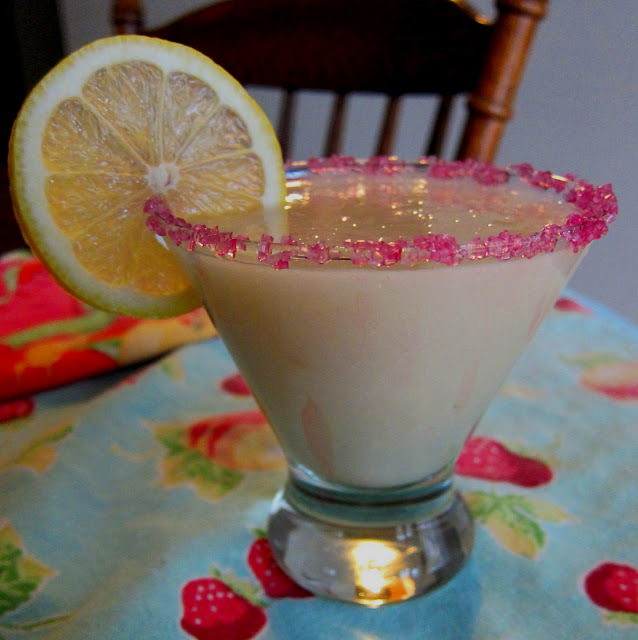 It actually ended up reminding me of a pina colada sort of flavor with the cherimoya puree...but better! You don't need a holiday to whip up a batch of these...so go ahead and make one...relieve some post work stress and enjoy a delicious drink! Combine all ingredients in a martini shaker, and give about 15-20 good shakes. Pour into margerita glass and enjoy! Thanks for this recipe! What do you use for the cherimoya puree? Just cherimoya?